When you’re preparing for your road test, the majority of people are strictly encapsulated in a world of studying driving theory, practicing parallel parking, memorizing which way to turn the wheel on a hill, and other skills required on a road test. Studying and mentally preparing for your road test is important to reaching your goal of a new or upgraded licence, but without a test-ready vehicle, you may be rescheduling that road test appointment. If ICBC determines a vehicle is unsafe or doesn’t meet specific legal requirements, there’s a strong chance that the appointment will be cancelled and you’ll be forced to repair or update your vehicle to comply with ICBC’s vehicle safety checklist. 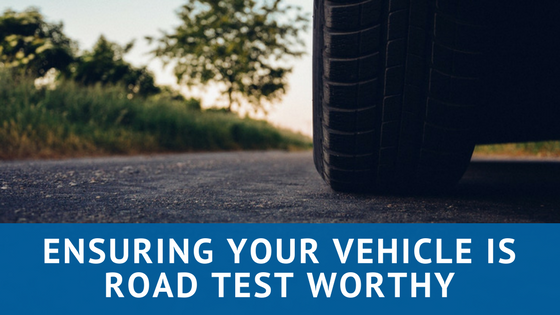 In this post, we’re discussing how to ensure your vehicle is road-test worthy so you can have a successful appointment. ICBC has a reputation for being stern on vehicle conditions prior to conducting a road test. The ICBC examiners are required to ensure that your vehicle meets all legal and safety provisions before getting started, and they may cancel an appointment for a number of reasons. Cambered/lifted suspension, engine mods, exhaust systems, lights, excessive window tint, etc. Airbags, ‘check engine’ light, oil pressure, etc. Before your test gets underway, the road test examiner will conduct a vehicle inspection to make sure your vehicle is up to the task, so it’s best to take the time to assess these inspection points prior to your appointment. Should you find that one or more of these points requires attention, you can think ahead and schedule a maintenance appointment for your vehicle or reschedule your ICBC appointment. ICBC requires 48 hours notice for a road test cancellation or rebooking, and a $25 cancellation fee may apply if you cancel too late. If you find that your own vehicle isn’t ready to undergo a road-test, you may also consider renting a vehicle from a car sharing co-op or a rental company. Always call them to discuss your reasons for renting - they may have stipulations for vehicles that are going to be involved in a road test. Some driving schools may also accommodate road test vehicle rentals that guarantee all ICBC vehicle standards are met. Drivers may also seek to borrow a friend or family member’s vehicle for their road test appointment and the same rules apply. Always take the time to check over the functionality and road-worthiness of the car prior to your test and make sure the vehicle is properly insured. Taking your Class 6 or 8 motorcycle road test is another scenario that warrants a pre-test check by an ICBC test examiner. During motorcycle road tests, the examiner cannot ride with you, but follows behind in a car, communicating requested road movements and directions via two-way radio. Motorcycle pre-trip inspections may include similar points to a car, van, or truck, but can also include checks unique to bikes. For example, your examiner will check to ensure the motorcycle you intend to take your test on has an engine with a power rating of over 200cc. Motorcycles and scooters with engines under 200cc may be used, but the type of license you will receive may be restricted to limited speed motorcycles. You may be required to update your licence and take a road test if you plan on towing or hauling a recreational trailer with a fully loaded weight of over 4,600kg gross vehicle weight (GVW). Your truck and house trailer or heavy trailer (without air brakes) must meet all legal and safety provisions as listed above with valid registration and insurance for both the truck and trailer available. In order to road test the trailer must be fully loaded (at least 4,600 kgs). 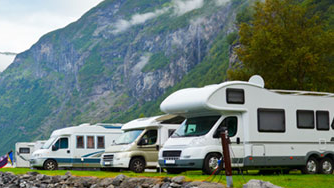 For house trailers water and propane tanks must be full as if you were travelling, and any gear you plan on carrying must be properly secured in the trailer. For those using a truck and horse trailer on a road test – live animals are not permitted on an ICBC road test; consider securing bales of hay in the trailer to provide the necessary weight requirement. Dangerous goods, explosives, unbaffled liquid or dry bulk, livestock and oversized loads are not permitted on a road test. Obtaining a class 1 or class 3 licence also requires a road test with an appropriate truck and/or trailer representative of that class of licence. Acceptable vehicles to use for a class 3 road test are large tandem or tridem rear axle trucks such as a moving van, dump truck (no trailer) or a semi-truck (no trailer). Acceptable vehicles to use on a class 1 road test are loaded tandem or tridem rear axle tractor trailer combinations with air brakes and an on-road loaded weight of at least 28,000kgs. In addition, the semi-trailer must be at least 13 metres long (7.5 metres if pintle hitch trailer). The vehicle must meet safety standards (as listed above) and valid registration and insurance papers for both the truck and trailer must be in the vehicle. Any load must be properly secured and unable to escape, shift or sway. Dangerous goods, explosives, unbaffled liquid or dry bulk, livestock and oversized loads are not permitted on a road test. Also, remember to bring the tools and equipment you may need to conduct the pre-trip inspection portion of your road test. 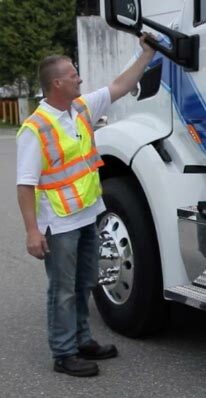 Wrenches, a brake-buddy or pickle fork, a timer or watch and wheel blocks are typically required during the pre-trip inspection. Bringing a safe, reliable, and properly insured vehicle to your road test will ensure your road test will continue as scheduled. Taking the time to conduct your own pre-trip vehicle inspection saves you both time and money by not having to reschedule the road test appointment you’ve waited and worked hard to prepare for.